Office 2.0 Reviews: Twitter for Business? Yammer! When you're running a virtual team, it's hard to put a price tag on effective communication. An engineer didn't participate in a decision - problem. Sales filed a feature request a while ago, but it slipped through the cracks - problem. Someone was sick and wasn't in the office when things were discussed, and now they need to be brought up to speed and another meeting has to be called cause they have something to contribute - problem. Someone else wasn't copied on the right email - problem. These little problems pile up real quick and if not addressed, become big problems. And that's when people are in the same office, for virtual teams, square that. Another everyone's favorite topic is status reports. I'm yet to see consistent and effective status reporting - by the time those reports are put together (if they do), it's typically late to react, not to mention that getting those is like pulling teeth, and getting into the level of detail that's necessary in order to be useful is very difficult to achieve. In fact status reports was the reason we decided to give Yammer a try. 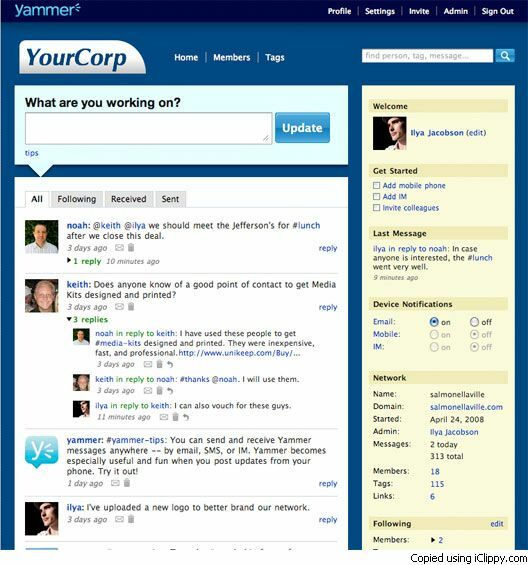 Yammer is a business version of Twitter - microblogging at its best. We've been using it for a month and so far its been working quite well. Not only is everyone copied on the conversations (they have visibility and access control mechanisms in place of course), but Yammer has become the 1st filter for bugs, enhancement requests, and troubleshooting. One of the major benefits of microblogging is hastags which allow to quickly structure the information without maintaining a stringent structure. So adding things like #bug, #review, #status, make it real easy to then go back and pull just those that fall under one of those tags. Yammer is not the only option for business microblogging. Some platforms like SocialText, CentralDesktop, ZohoProjects have also implemented it inside of their systems. The benefit of Yammer is that you don't have to be tied to a larger platform to use it, plus it provides a desktop client (Adobe Air based), and an iPhone client. If productivity improvement is the proper measure for tools, I'd say you should see a good 10% improvement out of Yammer... Of course, like with any other tool, making it work will take some effort. WSJ Article on "Why Email No Longer Rules… "